By car appox. two hours twenty minutes. The stone built Villa Gelincik was built by Gary Revell, a New Zealander. 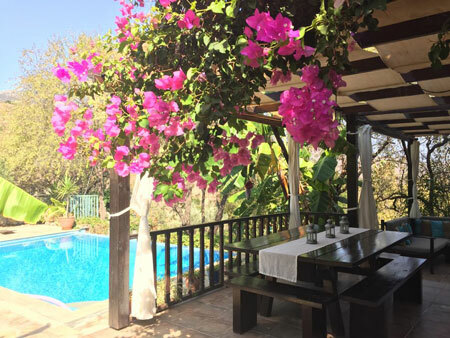 The villa is located on the hillside approximately a twenty five minute walk from the harbour above the village with panoramic views of the bay and the surrounding mountains. You approach the villa up a steep lane with a double parking area under the large almond and olive trees . There are two sets of five steps to the main entrance of the villa. The garden surrounding the villa has lemon ,almond, olive and banana trees. The villa has several other luxury private houses as neighbours and the exclusive eight room Swan Lake Boutique Hotel is only 80 meters away. MASTER BEDROOM (first floor) - The bedroom has a queen sized bed with en-suite shower, WC and a double wardrobe. It has A/C. It has a double balcony with sea views. There are also sea views from two windows and the third window has mountain views. BEDROOM TWO (first floor) - The bedroom has twin bed and is large enough to take an extra bed or cot. It has en-suite shower and WC, double wardrobes and A/C. The balcony has pool and mountain views. BEDROOM THREE (first floor) - The bedroom has a double bed with en-suite shower and WC. It has a double wardrobe and A/C .The balcony has sea views. BEDROOM FOUR (ground floor) - The bedroom has a double bed, Double wardrobe, A/C and a balcony with sea views. The separate shower and WC is next to the bedroom. The lounge area has views out over the Aegean Sea, with a hand-built stone fireplace as a feature. There is also a plasma TV, Wifi (free), iPod docking station, DVD player, board games and binoculars for your use. There are over 200 books available, so you’ll never be short of a good read! A modern open-plan kitchen which looks down onto the lounge includes: Granite work-tops, wall oven, microwave, gas hob, large fridge/freezer, dishwasher, extractor fan, toaster, kettle, granite island work space and sharp chef knives. The villa is smoke free (inside) so please respect this request for your fellow guests. This also includes e-cigs. There is an Information Book at the villa which we update on a regular basis. It has all the information you need on restaurants, beaches, historical places of interest and, of course, how to work all of the facilities at the villa. 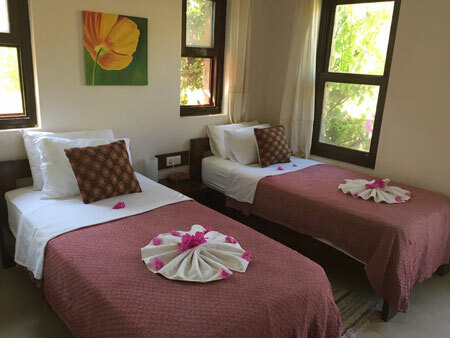 Your weekly Villa price includes; All utilities, free WiFi internet, all bedroom linen and bathroom towels, pool/beach towels, pool care, a daily light clean from Fatma, our caretaker, and as much local advice as we can give you! Personally, we feel that the outside area is the special part of Villa Gelincik. As you walk through the back door to the pool, you step out into the covered terrace area that provides cover by way of shade sails and a wooden pergola. Straight ahead of you is the large outside dining table that comfortably seats 8 people. We have bench or individual seats, to suit your needs. On the terrace there is also a generous sized BBQ (charcoal) to cook all of that fresh Aegean seafood. We have a comfortable couch area that catches the best of the cooling breeze and has views out into the bay. The perfect place to read your book. In the morning, with the still air, you can hear the fishermen down in the harbour, chatting and preparing their boats for the day. The crystal clear private pool is a generous 40 sqm (8x5), overlooking the Aegean Sea. It is a consistent 1.60 metres in depth and maintained daily by our housekeeper Fatma. For sun lovers there are wooden sunbeds and shade umbrellas. The gardens are fully landscaped using local stone, 50 year old railway sleepers, pebbles, paving stones and a lot of sweat and blisters. The gardens include olive, almond, lemon, walnut, bay leaf and banana trees. Also included with the villa : Hairdryers, iron, ironing board, kitchen spices, board games and puzzles, DVD's, washing powder, dish washing liquid, toilet paper.